Markook bread, also known as khubz Ruqaq, shrak, khubz rqeeq,, mashrooh, or saj bread (Arabic: مرقوق ، شراك ،مشروح ،خبز الصاج, خبز رقيق, خبز رقاق ) is a type of unleavened Arabic flatbread common in the countries of the Levant and the countries of the Arabian peninsula. It is baked on a domed or convex metal griddle, known as saj. It is usually large, about 60 cm in diameter, and thin, almost translucent. The dough is unleavened and usually made with only flour, water, and salt, and after being rested and divided into round portions, flattened and spread across a round cushion until it is paper thin then flipped onto the saj. It is often folded and put in bags before being sold. 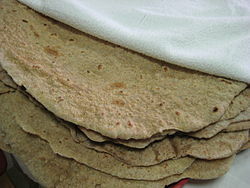 It is commonly compared to pita bread, which is known in Mediterranean cuisine, although it is much larger and thinner. Markook مرقوق comes from the Arabic word raqiq رقيق meaning delicate, and raqiq رقيق also comes from the Verb Raq رق. Markook was also mentioned in Ibn Sayyar al-Warraq tenth-century cookbook with the name Ruqaq, he describes it as large and paper-thin bread. ""Saj Femmes" - Blog: Land and People". Retrieved February 21, 2008. ^ "طريقة عمل خبز رقاق - موضوع". موضوع (in Arabic). Retrieved 2018-11-27. ^ Elamine, Anthony Morano and Leila. "Rima's Saj Bread Film |The Recipe Hunters in Lebanon". The Recipe Hunters. Retrieved 2018-11-27.